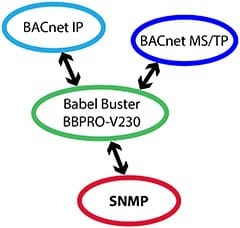 The Babel Buster Pro V230 BACnet to SNMP gateway allows BACnet devices to communicate with SNMP devices. BACnet objects may appear as OIDs in the BACnet to SNMP gateway MIB. The Babel Buster Pro V230 can also query SNMP devices and make MIB data available as BACnet objects. 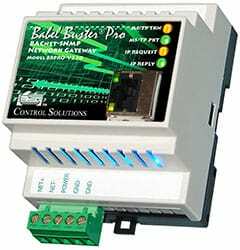 The Babel Buster Pro V230 contains a user defined set of BACnet objects. Those objects are mapped to the BACnet to SNMP gateway’s MIB, each with a unique OID. 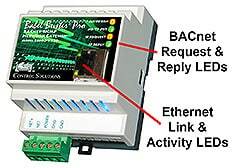 The gateway’s BACnet client can query other BACnet devices and store those values in the gateway’s local objects. The gateway’s SNMP client can query other SNMP devices and also store those values in the gateway’s local objects. Both clients can also write to other BACnet or SNMP devices. The objects or variables that are to be read or written in other devices are easily configured by the user. At the same time, other BACnet devices can query the local BACnet objects in the gateway, and other SNMP devices can Get/Set objects via the MIB. The Babel Buster Pro V230 also includes an automatic table walker and flexible trap receiver that fully supports connecting BACnet to a UPS that implements the RFC 1628 MIB for UPS systems. 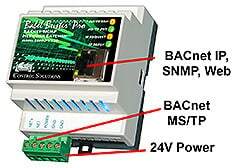 BACnet MS/TP is standard model. Optional -SP version available as order option. Select the serial port option when you place your order. Control Solutions’ Babel Buster® Pro-V230 is an enhanced gateway with advanced features to support connecting BACnet IP and MS/TP to SNMP v1 and v2c. A variant of the Pro-V230 also includes support for connecting devices having a proprietary serial protocol to SNMP or BACnet IP. The Pro-V230 includes an automatic table walker with multiple algorithms making it suitable for walking the sparse alarm table found in UPS systems implementing RFC 1628. The table walker can easily translate the alarm table into a series of BACnet objects for easy access by a BMS. The Pro-V230 includes a trap receiver supporting both v1 and v2c traps. The template driven trap receiver provides multiple algorithms for recognizing traps, and can easily place trap information into BACnet objects. 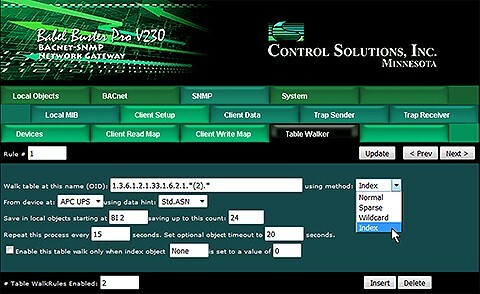 If more complex treatment of trap information is needed, Script Basic can be used to process traps and place resulting data into BACnet objects. The Pro-V230 is itself an SNMP device. Local BACnet objects can be assigned to either of the branches of the local MIB for remote access by other SNMP clients. The local data may be accessed as scaled integer or 32-bit floating point (RFC 6340). An SNMP Get to the Pro-V230 will read local objects and an SNMP Set will write the local objects. If local objects are mapped via BACnet to write to other BACnet devices, then SNMP Set will result in writing to a BACnet device. The Pro-V230 can send v1 or v2c traps based on threshold rules created via templates in the Pro-V230’s web UI. When data in the local objects meets the rule criteria, the trap will be sent. Traps can be triggered by reading other BACnet devices or by any other source of local data including Script Basic. The Pro-V230 includes an SNMP client that can read and write MIB variables in other SNMP devices. When reading, the remote device’s data will be stored in a local object. When writing, data will be taken from a local object and sent to the remote SNMP device via SNMP Set. The Pro-V230 can be BACnet IP and MS/TP client and server (concurrently). Maps created via templates in the Pro-V230’s web UI will read and write other BACnet devices, copying their data to local objects when read, or sending data from local objects to those devices when written. The Pro-V230 includes template based rules for simple calculations and data tests. These can be used for simple data manipulation. If more complex formula based data treatment is needed, Script Basic has access to all local objects. The Pro-V230-SP variant of the device repurposes the serial port to be used for a proprietary serial protocol instead of MS/TP. When used for interpreting a proprietary protocol, a Script Basic program would be written to send and receive via the serial port as applicable, and interact with the local BACnet objects (and MIB variables) under user program control. The Pro-V230-SP allows you to BACnet enable or SNMP enable serial devices that otherwise have no network connection. Combined with rule templates, Script Basic can generate BACnet COV notifications or SNMP Traps. The alarm table in a typical UPS system cannot be directly polled due to the fact that alarm table entries are only present while alarms are present, and attempts to poll the alarm data with no alarms present will result in errors. The table walker in the Pro-V230 has the intelligence to scan the alarm table for alarms, and set BACnet Binary objects to Active when alarms are found, and automatically clear Binary objects to Inactive after a timeout when not found. In addition to walking the alarm table of a UPS, the trap receiver in the Pro-V230 can effectively translate SNMP Traps into BACnet COV notifications. The combination of trap receiver and BACnet client also means SNMP Traps can result in writing status information to objects in other BACnet devices. The SNMP Client can be set up to periodically poll the MIB of the UPS to provide data to the BMS via BACnet, and send COV notifications upon change in values if desired. A configuration file for connecting an RFC 1628 UPS to BACnet has already been created and is available to use as is or as a starting point for a more complex multi-unit system. Configuration of the gateway is done via the web pages served by the internal web server. The user simply fills in templates. The entire configuration is saved in the internal Flash file system in XML format. This file may be exported to replicate additional copies of the configured device, or for backup. Script Basic provides unprecedented power and flexibility for creating the ultimate SNMP trap receiver. A special set of commands have been added to Basic to provide access to received traps. Basic can also read and write BACnet object values, and inspect or set BACnet object reliability codes. .
Click the link below to view a demo copy of the entire Web UI in the BBPro-V230. Watch these videos for an introduction to configuring the Babel Buster Pro gateway. It's easier than reading!